Waterfront Access points – places where you can access the edge and see the water though not necessarily see a boat or get on a boat or touch the water itself. Red Hook Ballfields Want contemplative privacy? There is an intimate nook overlooking the Henry Street Basin and the looming grain terminal. Amenities: many picnic tables and benches arranged in a crescent most under shade trees, a semi-circular paved patio with a compass rose, garbage cans. Columbia Street Esplanade called “long dock” by the old timers. This runs from behind/east of IKEA down a long straight-away and takes a bend right/west. Fishing is allowed after the road takes that bend. Amenities: benches and garbage cans, views. IKEA created an Erie Basin Park that runs east to west from Columbia Street to Dwight Street. Amenities: looming shipyard gantry cranes lit at night, open spaces and private nooks, diverse seating, inland and waterside lawns, piers, a fishing pier, maritime relics and signs explaining the famous Todd Shipyard that was on this site. The private property of the O’Connell’s offers a long, diverse swath of waterside access with lots of amenities that runs west and north from the Beard Street Pier almost to Valentino Park. It links three handsome Civil-War era brick warehouses, a historic ship, a park, a beach, and Fairway Market. From the foot of the Beard Street Pier, you can get close enough to see passing tug captains smile. The west side of the Beard Street pier is public access (the east side is for truck loading). There are big open views from the rest of the Beard Street Pier to the esplanade behind Fairway Market which has an outdoor café. Cross Conover Street to the short stone Pier 44, home of the LEHIGH VALLEY 79 barge, which has a good view of the harbor anchorage, the Red Hook Channel, and, looking back, the brick warehouses so characteristic of Red Hook. Two of them (Pier 41 and Beard Street) are the last remaining warehouse piers in NYC. The Pier 44 Waterfront Garden has a small point with seats under trees backed up by a landscaped garden and a path that has more intimate views overlooking a cove and pebbly beach that runs to Pier 41. Garden hours are a flexible dawn to dusk, often going later in summer. Pier 41’s offshore end is the private space of Liberty Warehouse catering hall. The south side of the pier is public-access, and the north side is the loading dock side. Valentino Park and pier of the Parks Department is a small gem with a huge view! Red Hook has the closest full frontal view of the Statue of Liberty of any NYC neighborhood. Take in a large sweep of the harbor and one anchorage. Passing ships come very close That’s cruise and container ships, bulk carriers and sewage tankers. Yes, NYC ships its poo! Tugs and barges, ferries, sailboats… just about anything that floats in this harbor. There are free summer movies, great fishing off the pier, and a boat launch for hand-powered boats. 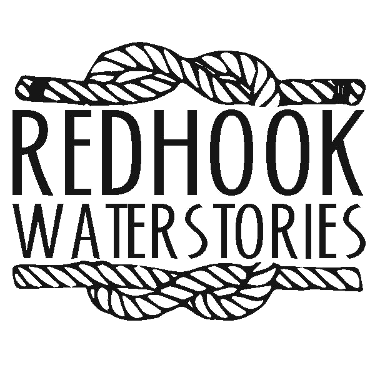 The Red Hook Boaters offer free kayaking on Sundays, 1:00 - 4:00PM: June 5th until September 25th and during special events. Just outside the park, eat desserts from Steve's Key Lime Pie on brightly painted picnic tables. Pier 11 and all the asphalt outside the Brooklyn Cruise Terminal is a public access space. Pier 11, Atlantic Basin, is the homeport of our MARY A. WHALEN (which you can visit). The pier has a changing, diverse array of vessels plus a good view of containerships loading and unloading in the Red Hook Container Terminal that are close enough for you to hear the bells when the gantry cranes roll and see the containers whizzing through the air. When cruise ships are in it is possible to enter the Brooklyn Cruise Terminal area and photograph the exterior of the ship, and you can see them from our MARY. The cruise terminal is closed when no ship is in. June 1, 2017, NYC Ferry service begins in Red Hook as part of the South Brooklyn route. The ferry landing is in Atlantic Basin parallel to our MARY A. WHALEN between the MARY and the Brooklyn Cruise Terminal on Pier 12.